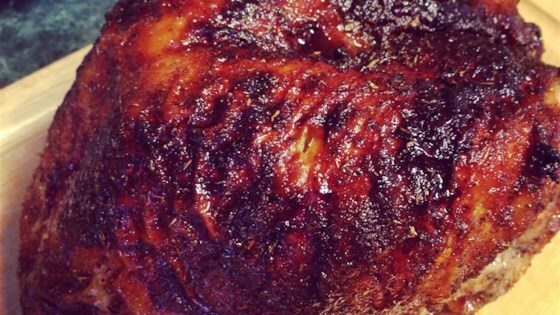 "A great way to make make a flavorful turkey roast for any night of the week. It's also great when you're having just a handful of people for Thanksgiving." Remove the plastic netting and wrap from the turkey roast, if any, but leave on string netting. (Remove and discard gravy packet, if any). Rinse the turkey, and pat dry with paper towels. Mix together the maple syrup, smoke flavoring, paprika, salt, pepper, garlic powder, onion powder, thyme, and cayenne pepper in a bowl, stirring to combine well. Brush the syrup mixture all over the turkey roast. Place the roast, skin side up, on a baking rack set in a roasting pan. Roast in the preheated oven, basting occasionally, until the roast is golden brown and a meat thermometer inserted into the center of the roast reads 170 degrees F (75 degrees C). Roasting time is about 1 1/2 hours. Wrap the roast in foil, and let stand 10 minutes before removing the string netting for slicing. Fantastic! I made mine in a crock pot with 1/2 c extra water cooking it for 8 hours on low. It was moist and delicious!